My A to Z muse seems to be on a break for the letter M. Well I actually have a lot of M words floating in my head, Mother, Mistake (wait that was last year’s M word), Minute, Midway (as we are midway through the Alphabet today! ), Müll (meaning garbage), Madame, Music, Middle school. None of those words really stuck, at the moment there seems to be no M word that my authentic self needs to write about. Last week, while outside I came across a strange phenomenon, a tree that seemed a bit lost. A cherry tree celebrating all four seasons at once! Some leaves were coloured by the advancing autumn, some were green as though in the middle of summer, then there were signs of winter with there being only bare branches. But the reason this cherry tree attracted my attention was that about half the tree was blossoming! 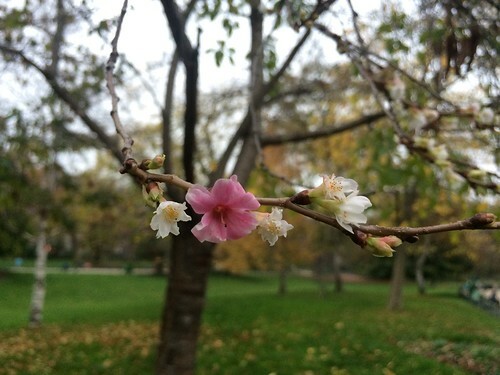 Cherry blossoms in November in the northern hemisphere?? It does happen! See for yourself. © Solveig Werner 2015. All rights reserved.